I made some mincemeat a couple of weeks ago, and the jars have been maturing in a dark corner ever since. Time to make some mince pies. 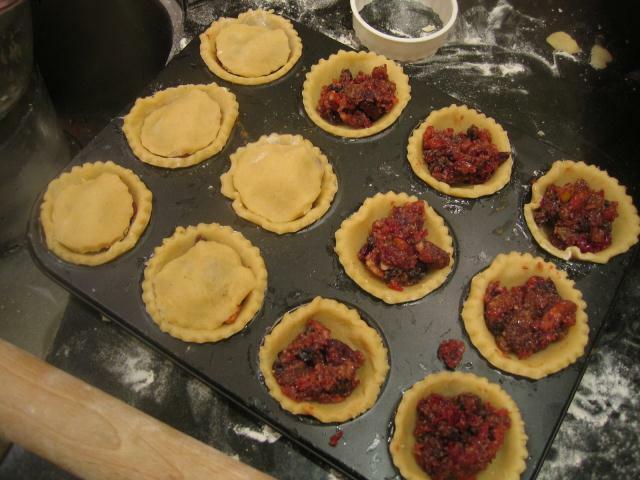 Mince pies need a good shortcrust pastry, of which there are many versions. I use an Italian almond shortcrust, modified from a recipe by Alistair Little. Put 150g of unrefined golden caster sugar, 500g of plain flour and 100g of ground almonds into a food processor and quickly mix. Cut 500g of butter (that’s right, 500 whole grams – two blocks) into cubes and add to the flour. Pulse quickly until the butter is cut into the flour and the mix resembles breadcrumbs. Add two large eggs, a splash or rum and half a teaspoon of lemon zest. A small squeeze of the lemon itself doesn’t hurt, and neither does an extra egg yolk or two for added richness. Mix until the mixture comes together into a ball, remove from the bowl, cover and refrigerate for at least an hour. The quantities given are likely to be too much for most domestic food processors, so I normally mix the flour, sugar and almonds together in a large bowl, divide the mixture into two and cut one block (250g) of butter into each half, using the food processor, bringing the dough together with one egg for each half. After the dough has chilled, take about a quarter of it and carefully roll it out on a well floured surface to about the thickness of a pound coin. Keep the rest of the dough chilled. This dough is happiest when it’s cold, so work quickly and handle it as little as possible. Grease the holes in four twelve-hole mince pie or Yorkshire pudding trays. These quantities will produce forty-eight mince pies – if you’re lucky enough to have four trays and an oven big enough, do them all at once, otherwise aim for two batches. Forty-eight mince pies might sound a lot – an it is – but they’ll soon disappear. Two pastry cutters are needed, one to cut the base and another to cut the lid. Choose a cutter that cuts a base that’s a bit too big for the holes in your pie tray, so that the base stands slightly proud of the tray. This helps to stop the filling spilling out during cooking. Assemble the pies by cutting the base, filling the pie with about a dessert spoon of mincemeat and adding a lid, pressing down lightly. Bake for twenty minutes at 180c, until lightly browned. You may need to allow another couple of minutes, but once you’re past twenty minutes, watch things carefully – this pastry burns easily. Once cooked, leave the pies in the tray for a few minutes, then turn out onto a wire rack and allow most of them to cool. The temptation to try one or two whilst still warm is irresistible and, well, it is Christmas.